Bongbong Marcos believes that running after certain politicians who have done alleged anomalies must not be prioritized. The judicial system must take care of that. But he will strongly go against it. He is pertaining to former President Benigno Aquino when asked if he will prosecute Pnoy and his cabinet for DAP when he becomes Vice President. 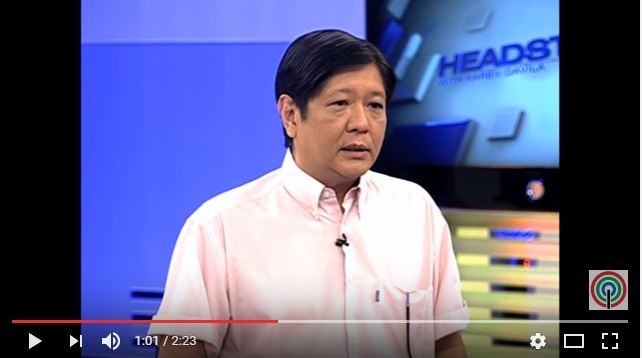 [VIDEO]: MANILA – Despite the decades-old political rift between their families, Senator Ferdinand “Bongbong” Marcos, Jr. believes the next administration should not run after President Benigno “Noynoy” Aquino III over alleged railroaded budget allotments. The most qualified Vice Presidentiable of the Philippines thinks that it is counterproductive to spend lots of efforts conducting probes to prosecute government officials can further jeopardize the country. It should not be the main priority as we have seen in the Pnoy administration. Bongbong Marcos will not convince the Duterte administration to run after anybody – like some kind of vengeance, If the citizens feel that some officials are answerable to accusations, they must file a case. It should not be the focus of the present administration because it will result to disunity. Marcos always says that the kind of policy that Aquino administers running after other accused government officials did not lead us anywhere. He will not do the same to former President Benigno Aquino III because he does not believe in that kind of policy. It will only turn apart unity; according to him. It cannot be a policy of the government to run after government officials answerable of anything. The lives of ordinary Filipinos have not improved with Pnoy’s fight against corruption. Executives are here to solve problems by creating and implementing policies. The Judiciary can take the route of any complaints by any citizen for that matter. Bongbong Marcos is a very decisive speaker just like his father. You can only agree with his thoughts given his brilliant explanations. The heart is also very evident. There are no traces of hatred in him despite the family ordeal after the EDSA revolution. The past pains instead made him a wiser man. Without the official title, Bongbong Marcos has been acting like President Rodrigo Duterte’s Deputy President, if not Adviser. He is consulted for many vital issues, an important part of the delegation in China during Duterte’s state visit and the Marcoses’ idealisms are also continued by the present administration. It is hoping against hope that Bongbong Marcos who has every good intention like President Duterte can better implement their plans with his likable personality, charm and with. Even Kris Aquino will not dare challenge that.